BAT - BLOG : BATMAN TOYS and COLLECTIBLES: Matias' Insanely Cool #BATMAN VS #JOKER TATTOO ART Photos! 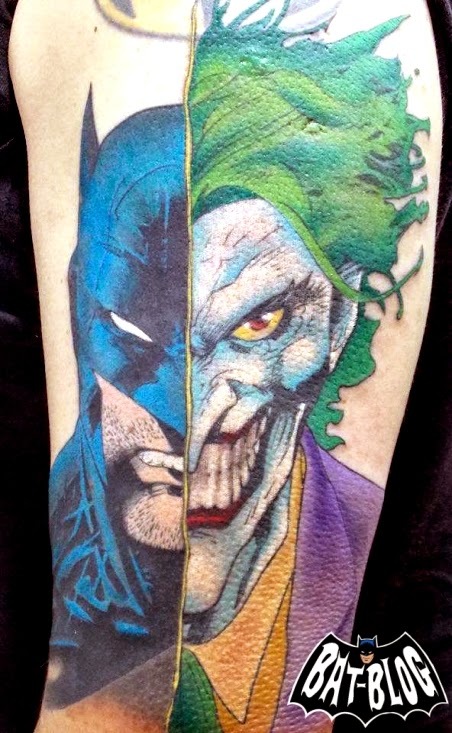 Matias' Insanely Cool #BATMAN VS #JOKER TATTOO ART Photos! One of the things that I'm most happy about doing the BAT-BLOG is getting the opportunity to meet Batman Fans from all around the world. I've been on the Internet for a very long time and I'm still amazed about being able to have casual conversations with people from all around the world. Here's a great example! Check out these fun pics sent to us all the way from Argentina. A friend named Mathias Martin Saucedo shared this set of BATMAN/JOKER TATTOO ART photos the other day. Yes, Matias got some Bat-Ink done! The Tattoo Artist's name is Juan Salinas and he is considered to be one of the very best tattoo artists living in Argentina. The photos right here really prove that! Down below are some shots taken in the early "black ink line" stages. Then, up above, we get to see it all completed in it's full-color glory!